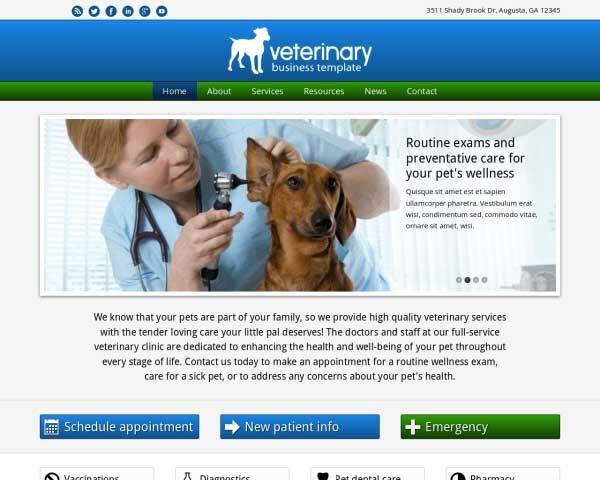 You can create a professional online presence for your dog training business even if you're on a budget or you've never built a website before. 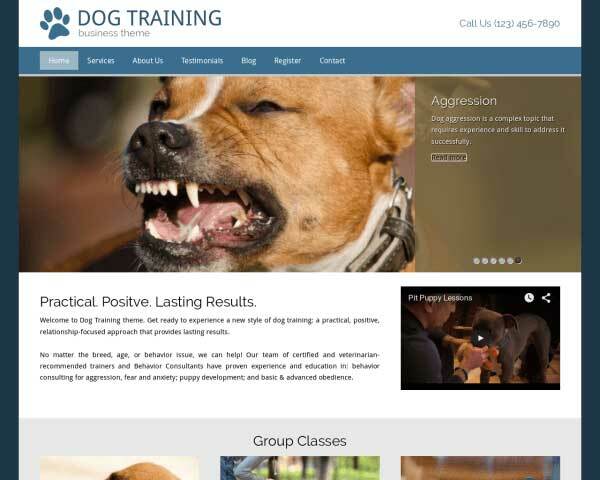 The Dog Training WordPress theme comes preconfigured with pages filled with placeholder content so all that's missing is your own photos and text. 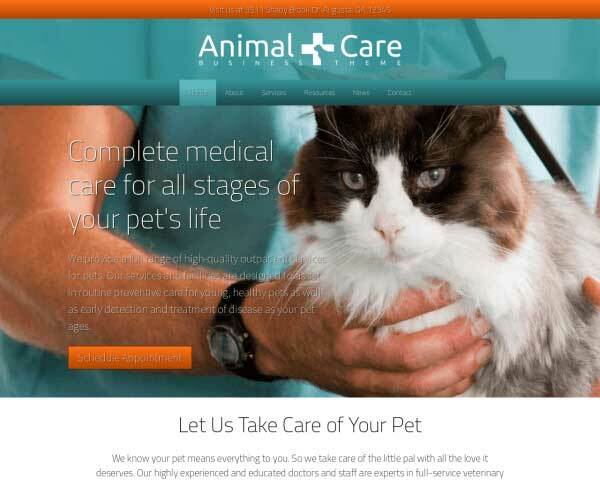 We help you get your complete dog training website online fast! Precocious puppies and nice dogs with naughty habits just need a little guidance. 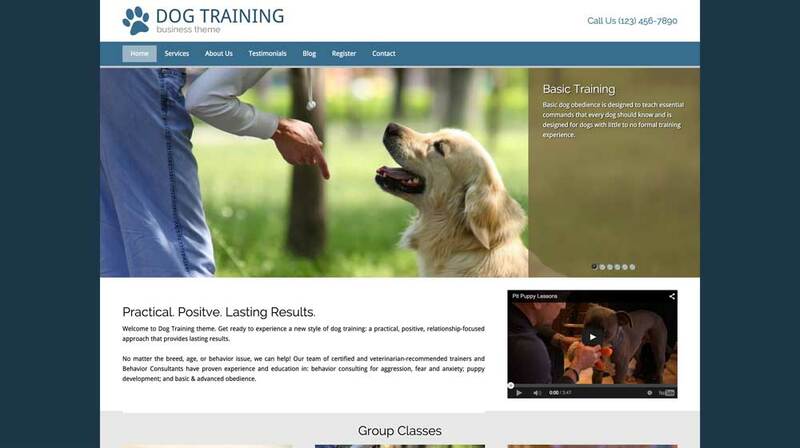 Show dog owners how your classes can help them with basic training and behavioral issues through a professional website built with the Dog Training WordPress theme. 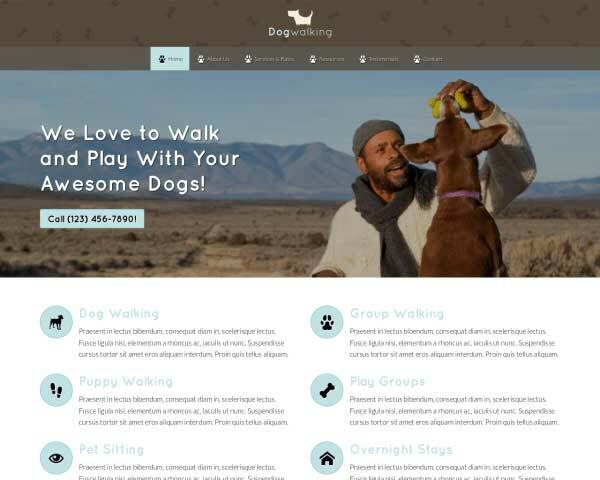 Besides a cheery, clean design and easy navigation, this pre-built website template allows you to offer visitors detailed information about your dog training methods, a news blog, and even online class registration. 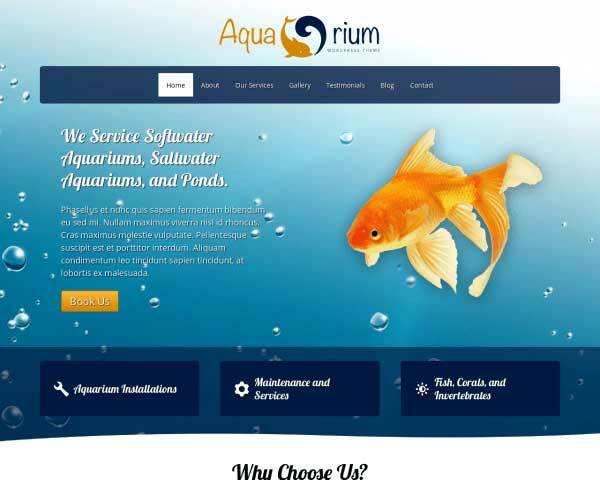 We've designed this WP template will all the important pages and features installed upon activation, so you'll only need to replace the demo text and images to get your complete website online in no time. Our visual front-end editor makes it simple to change the color scheme and styling to give your website a personalized look and feel. We've also included premium features to promote your business and get more out of your online presence, like integrated social media options and a helpful SEO manager. 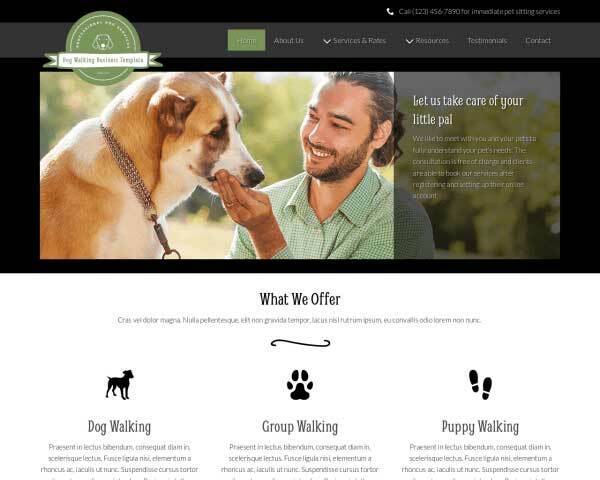 Made just for dog trainers who need to build a website without any coding, the Dog Training WordPress theme is a smart way to grow your business and attract new clients online! Keeping your blog updated regularly can increase page views and help boost rankings.The Dog Training WordPress Theme comes with a blog, plus several sample articles. With the Dog Training WordPress Theme, visitors will be able to register for classes online through a built-in form that's easy to customize according to your needs. 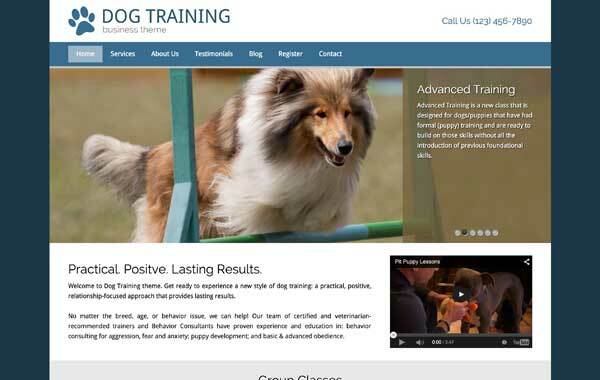 Ideal for any dog training website, the Dog Training WordPress Theme is made specifically with the needs of the dog trainer in mind. 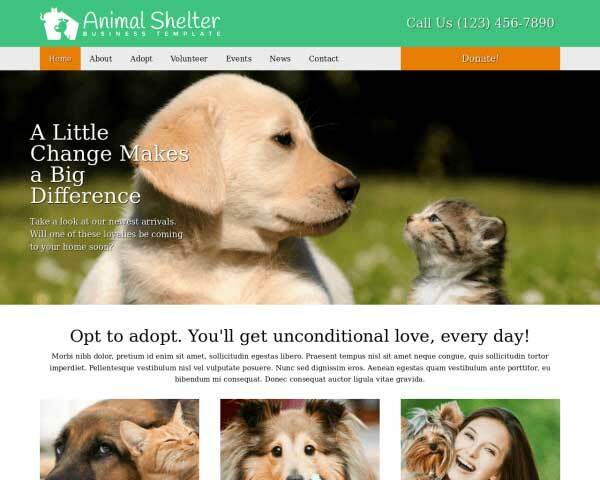 Highly visible call-to-actions on nearly every page of the Dog Training WordPress Theme encourage visitors to contact and makes it easy for them to do it! A classic image slider is included on the homepage in the Dog Training WordPress Theme, grabbing visitors' attention right from the start. The contact page on the Dog Training WordPress Theme is set up with space for your contact details, an integrated Google map and a route planner. Your prices and packages could not be any more clear than when displayed in bright blocks on the dedicated page of the Dog Training WordPress Theme. 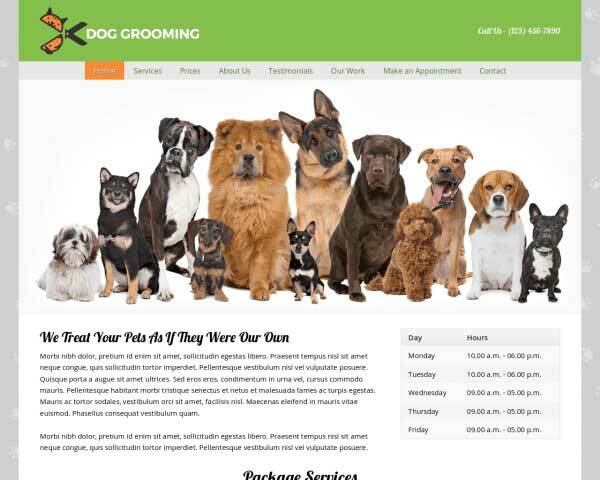 Describe your unique and appealing approach on the service detail pages of the Dog Training WordPress Theme. Simply replace the text and images with your own. Included with the Dog Training WordPress Theme are icons for the most popular social media platforms, allowing visitors to simply click to follow you online or share your content on their pages. Attractively display client feedback with the Dog Training WordPress Theme's quote widget. Just paste in your own text and the quotes will be automatically styled with no coding required. With the responsive Dog Training WordPress theme you'll never miss out on business from visitors using smartphones and tablets to view your website. This mobile-optimized WP theme is designed to automatically adjust your pages to display beautifully at any screen size, on all browsers and mobile devices. 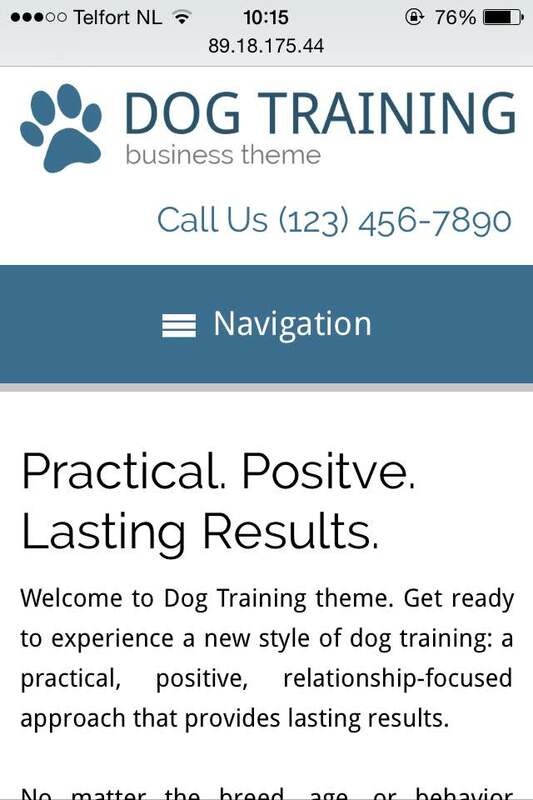 Mobile visitors to your dog training website will enjoy the same professional look and functionality of the desktop version plus the added convenience of simply tapping your phone number to dial or tapping your email to send a message.